Summer is a time for family, fun and food! There is nothing better than sitting in the shade by the pool, sipping on a cold drink and smelling the delicious aromas of barbecued food being cooked. As temperatures rise and Spring comes to an end you know it’s not long before Summer and that means time to get the barbecue ready! If you’ve never bought a grill before and want to find the best one you’ve come to the right place! There are so many grills to choose from so it can be confusing to know what you’re looking for. Don’t worry we have you covered as below we’ll be discussing what to look for in a grill depending on your preferences. We also share some of our favorite grills for the money based on models currently available on the market. One of the best things about the warmer months, at least for me, is the promise of many meals made out on the grill. You see, I grew up in the South where the warm season started fairly early and lasted fairly late into the year. It was the prime spot for serving up tasty steaks, burgers, hot dogs and even grilled veggies. Unfortunately, it was usually too humid to comfortably enjoy the meal out on the patio, but that does not mean that my family did not try! I come from a long line of people who love outdoor living, and all of us are master grillers, or at least we like to think so! Growing up, my family went through several different types of grills from the small charcoal based ones to the larger propane tank based ones. As you can see, overtime we upgraded our equipment. This was partially done out of necessity as the family grew and we needed more space for grilling the meat, but also because the higher end products actually do result in better food. If you can afford it, there is really no reason to continue using one of the old school charcoal style models. When I first moved out on my own, I had a small apartment and an even smaller budget. My very first grill was one of the little $20 charcoal models from Wal-Mart. It made terrible food. Seriously. It was so bad that I chucked it and got one of those little indoor George Foreman models. It was a sad day in my little apartment. But, after changing where I lived and getting a better paying job, I was able to upgrade to a small propane gas model that worked wonderfully. Over the years, I have tried out many different brands, sizes and models. Some have been for home use, some have been for tailgating and some have been for vacation get togethers at a rental condo at the beach. That being said, I have a lot of experience with a variety of the products. And since my family loves grilling, if there is a model that I have not tried, then I guarantee you that one of them has owned it at one point! With a little luck, my reviews and comparisons can help you pick the right model the very first time. Whether you are looking for cheap grills or the best grills for the money, I hope that you are making some great burgers, steaks and dogs with one of my recommendations before the warm weather ends! So, let’s get started! The very first thing that you need to do when you decide that you need to get one of these, is to come up with a budget. It does not have to be an exact number like “I can only spend $127 on this item.” Instead, try to think of a monetary range, as well as your ideal price point. For instance, you may determine that you can comfortably spend up to $500 but you would really like to keep it somewhere between $200 and $300 at the high end. Now that you have a budget, you need to determine how much space you have out on the patio, deck or porch for your new purchase. The last thing that you want to do is go out and get a huge propane gas grill that ends up taking up most of the space on the patio – or worse, does not really fit there at all! If you have tons of outdoor space, then you will not even have to worry about this. However, if you are in a townhouse, duplex or just a home with limited outdoor space, then this can be a real issue. My uncle Rob once bought one that was too big for the space. He ended up having to stand inside the doorway to do his grilling since there was zero room on the small patio for him to stand. It was hysterical, but not exactly practical. Another important part of your pre-shopping planning is this – can you transport the item to your home on your own, or do you need it delivered? Now remember, this thing will likely come in a huge box. And you will have to get it from your car to your home. Personally, I am all about the delivery right to my door. As a result, all of the models that I have bought have been ones that come with FREE delivery. However, you can visit some of your local stores to buy these same models, if you prefer. Good local places to shop include Home Depot, Lowes and Sears (at least in my area). So, be sure if you’re shopping online to confirm if shipping is included in the cost. Now, you are ready to start your comparison shopping. A good thing to keep in mind when shopping online is that you have access to reviews from people who already own the product. You do not have to just take my word on the quality of the item. Please note that any links you find for products on this site will take you to other websites where you can read through independent customer reviews. I highly suggest this as it gives you a comprehensive picture of the type of experience that you will have with your potential purchase. There are two main types of barbecue grill to chose from: gas and charcoal. You can also find electric grills, which are good for people who live in an apartment or condo, but we won’t be discussing those here. Instead, we’re focusing on charcoal and gas grills that you can use out on your patio or deck with friends and family. The main benefit of a ceramic model over a metal one is that the ceramic offers better temperature control when grilling. It also is better about retaining moisture, which means that your meat ends up more juicy and tender compared to grilling it in a metal charcoal grill. Keep in mind that with a charcoal grill, you have to regularly dispose of the ashes that are left in the bottom. Before removing the ashes, be sure to let them cool completely for at least 48 hours. You can pour some water on them to speed that process up a bit. To properly dispose of ashes from your grill, put the ashes in foil and discard in a trash can that is non-combustible. The benefit of charcoal grills is that they are often cheaper than their gas counterparts. So, if you’re on a budget go for charcoal although you’ll have to factor in the cost of coal or briquettes. Another advantage to charcoal grills is the fact that some are portable, meaning you can transport them to a better location for cooking and serving food to your leisure. The Weber 741001 Silver One-Touch 22-1/2-Inch Kettle Grill is my favorite little charcoal grill option. It is compact enough to easily fit on small patios, but large enough to have enough cook space for a decent sized family meal. Cleanup with this one is easier than with any other charcoal model that I have ever used. And you get beautiful sear marks on your meat. I love that is has wheels that are rated all-weather and some rust-resistant components. I often forget to cover my own, and this quality build gives me peace of mind that a little time out in the rain won’t damage it too much. 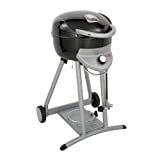 Plus, you can’t do any better when it comes to low price than this charcoal Weber model. 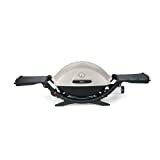 If you want a cheap grill for under $50 – $75 and do not mind if it is charcoal, this is Weber 10020 Smokey Joe Silver Charcoal Grill is a must-have for you. It is seriously cheap while staying to true to that Weber high quality reputation. It is designed to be portable, so it is best for things like camping, tailgating, vacation trips or just using as a little tabletop charcoal grill. You can fit around 8 to 10 burgers on it at once, which is kind of impressive for the size and cost. It is definitely the most budget friendly option available. Gas grills are convenient as they allow you to get cooking straight away and bypass the 30-40 minutes coal grills need for initial set up. The ignition method can be a push-start button, electronic or rotary lighter that is actually a permanent part of the grill. Not just that they also allow you to adjust the temperature on the fly for concise control over the cooking process. Some models also have infrared grilling burners, which heat up quicker and cook your food faster. If you don’t like to wait too long to eat, then this type of gas grill is definitely a good choice for you. 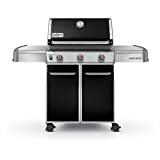 One downside to gas grills is the initial cost which is higher on average than coal grills, not to mention factoring in cost for gas cylinders. Another con is gas grills are often larger and not compact or portable like coal grills meaning they’ll have to stay in one place. You will notice that gas grills have a heat output measurement called BTU, or British Thermal Units. This measurement is based on the actual size of the gas burner, which means that comparing BTU ratings can be tricky due to burner size varying. For instance, a small grill that has a low BTU rating can cook at a similar heat output as a large grill with a high BTU rating. 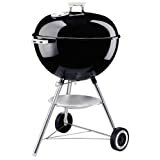 If you take a look at any of the selection of grills in stores or on the web, then you may quickly become overwhelmed by the never-ending number of choices available to you. Coming from a long line of grillers, I have had the opportunity to try out a bunch of different models – both gas and charcoal. As a result, I was able to come up with a list of the models that I think are the best buys for the money. While this list focuses on propane grills, you will see two entries for charcoal models. The reason for including these is to just give you an idea of what else is available. Personally, I prefer gas models but people who are shopping on a budget may discover that the charcoal options give them a little more money left over at the end of the day. 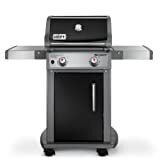 Take a look below to see my top 10 picks for the best gas grills for the money. Once you decide on your preferred type of outdoor grill for your home, there are actually a few more things to consider before rushing to make a purchase. Features tend to vary from one model to the next, and we’ve selected some things that we believe are the most important things to take note of when you do your comparison shopping for a new patio grill. How much space do you have outside to use and store your new grill? How many people will you be grilling for at one time? Will you need space on the cooking grids for larger pieces of meat, or smaller ones like chicken breasts? How many burners do you prefer (if shopping for a gas model)? There are four different types of cooking grids that you can find in a grill. Below are those types and the reasons why you might want to choose each one. Cast Iron – won’t rust if you cure them, they also cook and wear well. Of all the types, cast iron distributes heat most evenly. Porcelain-Coated Cast Iron – the perfect combination of eay cleaning and heat retention. Lasts longer than any other type and is rust resistant. Most grills are used for a few years before being replaced or upgraded therefore the build and quality of your grill is important so it lasts. 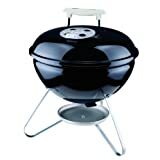 When buying through online retailers, you can zoom in on most any product photo to inspect each grill before you buy. When you do this, you should pay close attention to whether the joints are welded (more stable) or bolted (prone to coming undone). Otherwise a thorough inspection in-person would be beneficial. Some grills come with extra accessories that might be of interest to you. You likely won’t get any of the extra featured below with the really cheap grills, but moderate to high end models usually include some of the accessories below. Other things that you might consider buying include wood chips to enhance the food’s flavor or something to give you that charcoal fat-dripping on hot coals flavor like ceramic briquettes, pumice stone, heat plates, or lava rock. 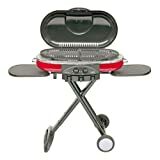 If you are looking for a propane gas grill that is portable enough to take on the road but large enough to use at home, then you need to check out the top rated Coleman 9949-750 Road Trip Grill LXE. This Coleman grill is perfect for tailgating, camping and grilling out at home. And it doesn’t get any better than that. Unlike some of the other portable grills that are available, this Coleman Road Trip Grill actually has a full-size grill cooking space. This is accomplished thanks to the scissor legs, which fold up for easy storage and transport. But don’t be fooled by their compact size because the legs are strong enough to make this grill a sturdy staple in your home. If you’re looking for something in particular in your next grill, it might be helpful to take a closer look at the features of this bestselling Coleman gas grill. 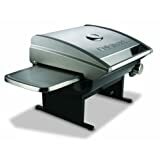 The benefit of the two burners is that it offers even cooking of the meat on your grill. There are two separate control knobs so that you can precisely control the temperature on each burner. The grates on the grill are warp-resistant and super easy to clean thanks to the porcelain coating. And that is not the only easy cleaning feature. This grill also has a grease tray that collects the fat drippings from the meat so that you can just slide it out to clean up the grease. With the two side tables that you can attach to the grill, you are able to give yourself some extra prep space while you are grilling. The great thing about this grill is that just takes seconds to set it up and tear it down. If you’re going to be using the grill for camping or tailgating, then this is an excellent feature for you.